THE TROUBLE WITH what passes for fly fishing literature these days is prose that overshadows the fishing, or even worse, fishing that overshadows even weaker prose. Too many current authors attempt to write in the style of Norman Maclean, Thomas McGuane, or David James Duncan—and most fail miserably. Enter writer John Larison, a man with the talent and experience to carry on in the tradition of Roderick Haig-Brown, Sparse Grey Hackle, and Robert Traver. John Larison’s new novel, Holding Lies, is the best piece of fly fishing fiction to come along in some time. 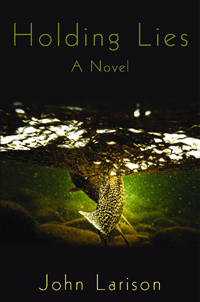 Set in the fictional Ipsyniho, Oregon, dead in the heart of steelhead country, Holding Lies tells the story of aging fly fishing guide Hank Hazelton, a man forced to take stock of his life after becoming a suspect in a rival guide’s death. The dead man, Justin Morell, is an upstart, new-breed guide, and one of the young guns who counts fish and craves immediate success. In river vernacular, Morell is a ‘joe’. Worse, the young guide has committed a fly guide’s greatest sin—in magazine articles and internet posts, he publishes the hard-earned secrets, hidden spots, tricks of the trade, and much more about fishing a hard-to-know river. For many, his death comes as a surprise, but for those making a living on the water, it comes as a silent relief. But is Morell’s death an accident—or is it murder? His is not the first suspicious death in this town, nor is it the first time Hank has experienced death on the water. For that reason the town sheriff has placed Hank’s name at the top of his list of suspects. Complicating matters, Hank’s estranged daughter Annie decides to reconnect with him after 14 years, and he is ill-equipped to handle the truth about his past that Annie’s visit dredges up. Steelhead fishermen are an obsessive lot. A steelheader’s passion for his prey and watershed is intense–a private love, closely held, and mostly secret. In this world lies are a common form of protection. Larison captures this fervor with strong three-dimensional characters and stirring plot lines that run seamlessly throughout the book, building suspense at every turn. Larison successfully maintains the story’s tension from each chapter to the next, keeping us longing for more. His characters come off the page and infect the reader’s psyche long after you’ve put the book down. We breathe with these characters and feel their every pain and longing, and their obsessions become ours until the very end. Larison’s story is as suspenseful as it is heartbreaking. At its very core is a story that explores the depths of family, friendship, and loyalty. Running throughout the novel is the notion that everyone has their own lies that cover the truths that are too hard to bear. Lies that lifetimes are occasionally built on. Larison is a guide, river steward, and English instructor, who studied under the wing of Ted Lesson at Oregon State University. His work has appeared in Gray’s Sporting Journal, Fly Rod and Reel, and American Angler. His knowledge of steelhead fishing is genuine, and in 2008, he published The Complete Steelheader: Successful Fly-Fishing Tactics, a comprehensive look at successful steelhead techniques. In 2009 he entered the world of sporting literature with his debut novel Northwest of Normal, which met with critical acclaim and introduced us to the hamlet of Ipsyniho and its quirky inhabitants of river guides, loggers, and burned-out hippies. The release of Holding Lies cements Larison’s reputation as an exceptional western author. If there is only so much room on your bookshelf for fly fishing fiction, be sure to clear a space for this memorable effort.